Ultrasonic devices made by Hielscher are used by chefs of high-class restaurants for innovative, high-quality cooking. This includes flavor extraction, emusification or modification of texture.Hielscher ultrasonic devices are used for manifold applications and proven for their performance, reliability and effectiveness. Due to their exceptional advantages, ultrasonic processors are applied for long time in the food processing industry, e.g. to emulsify immiscible liquids or to extract intra-cellular materials. A relatively new field of application for ultrasonic processors is the use in gourmet cuisine. Especially in the high-tech kitchen and molecular cuisine, there are manifold applications to prepare remarkable meals, which surprise the diner with new, intensive flavours. In March 2010, Sang-Hoon Degeimbre – chef and owner of the famous restaurant L’air du temps in Noville sur Mehaigne (near Namur, Belgium) – presented ultrasound as an innovative technique of preparing extraordinary meals on Starchefs.com (see video below). Degeimbre says he uses the ultrasonic machine for extraction of the favorite components of vegetables, flowers and herbs. He does not want to cook, but he want to have the most perfumed part of the vegetable material. He uses his Hielscher ultrasonic processor UIP1000hd (1000W, 20kHz) for various applications: By sonication, it is possible to extract the most aromatic and flavourful elements of each ingredients. This allows Degeimbre to reach a freshness of taste that would normally be lost during the cooking process. Furthermore, the star chef does successful experiments with extraction of shrimp and chicken for stocks. With chicken, he achieved good results by sonicating only the chicken meat without bones to get a very pure tasting chicken stock. On StarChefs.com, Michelin star chef Sang-Hoon Degeimbre showcases exemplary on one recipe of his contemporary cuisine, how to use Hielscher’s UIP1000hd in cuisine. 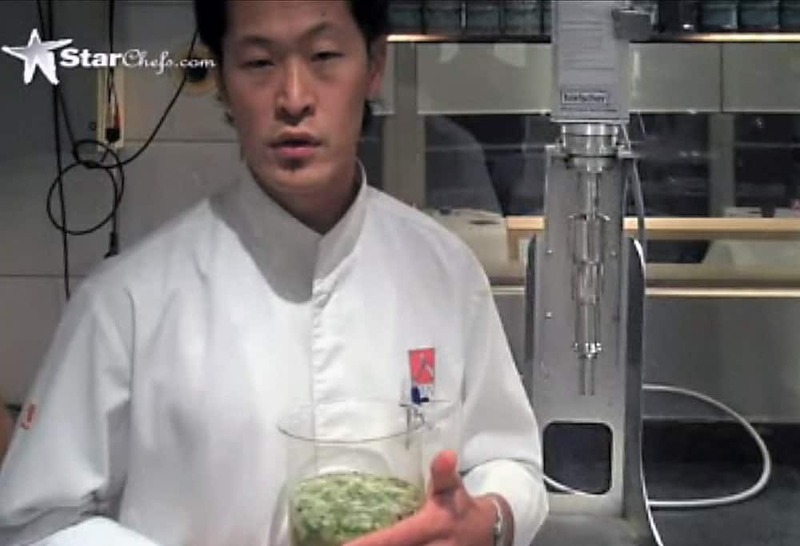 For the preparation of his creation Ultrasonic Shrimp Stock, the Belgian-Korean chef sonicates all ingredients (shrimps, water, tomato puree, carrot, salt) at 50% amplitude for 10 minutes. Ultrasound is also capable to emulsify liquids that normally would separate without emulsifiers. Therefore, ultrasonication allows the preparation of smooth vinaigrette, tasty marinades and creamy mayonnaise, without the utilization of emulsifying agents. The outstanding performance of ultrasonics for the flavouring of liquids is also used in the production of vinegar. Ultrasound makes it possible to produce vinegar with manifold different flavours, such as raspberry, lime, chili, thyme. To gain maximal results in flavour extraction, Hielscher recommends to macerate or to grind the material before sonication. This way, the material offers more surface area so that more intra-cellular material can be extracted. This enhances the results of ultrasonic flavour extraction and leads to a more intensive taste. The application of ultrasonics in chef cuisine a is very simple. In small batch scale – for up to 500mL – you can use ultrasonic laboratory devices, such as the UP400S. For larger volumes, Hielscher offers devices, such as the UIP1000hd with special sonotrodes. Talk to us today, to discuss your processing requirements. We will be glad to assist you and to recommend the most suitable ultrasonic equipment for your requirements. If you are interested in the application of ultrasonics in your restaurant or hotel kitchen, please use this form to contact us. Sang-Hoon Degeimbre began his career as a butcher and became than a sommelier, so that he developed his fine taste, which allows him to create new, extraordinary pairings of flavors. His passion for flavours induced him to start a career as a chef. The opening of his own restaurant L’Air du Temps in 1997 marks a milestone in his work as chef, which commits himself to the innovative molecular cuisine. 2001 he got rewarded with a star by the Michelin guide. A second star followed in 2008. Bake shrimp in at 130°C for 20 minutes. Put all ingredients in a large pot. Set the device (Hielscher UIP1000hd, B2-1.8, BS2d22) to sonication at 50% amplitude for 10 minutes. Blend, strain, and reduce to the desired consistency.